Just south of Lima are several popular surfing and vacation beaches. Along the way, you can purchase anything you might have forgotten. 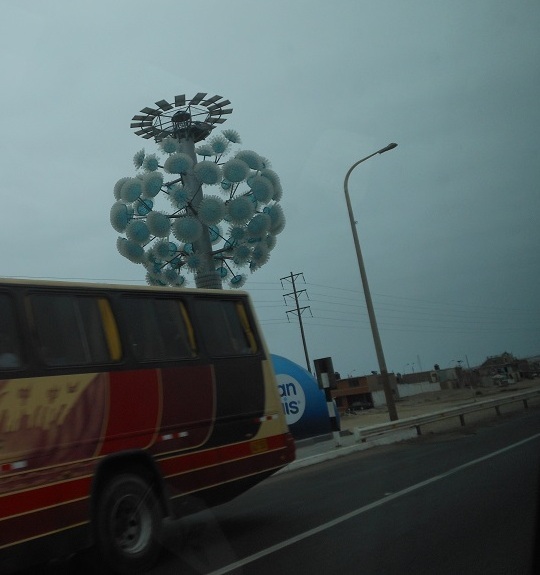 There are also some peculiar decorative objects along the highway. It looks like an elaborate arrangement of plastic strips–on a telephone pole sized stand. 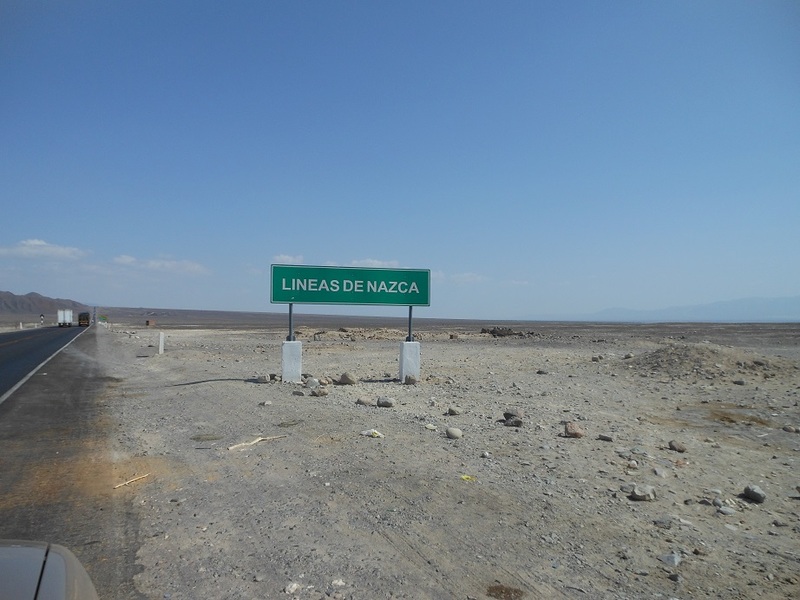 There is NOTHING on the road to Nazca. Without the discovery of the lines, this area might be empty. 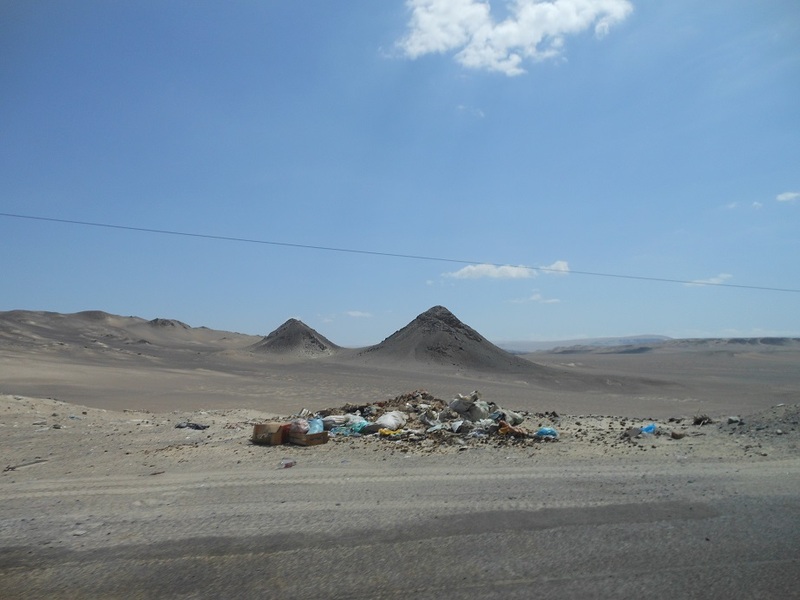 Sometimes the sights are better above the ground, as there is a lot of construction debris and garbage along the Panamerican highway. Despite what you see in these pictures, there are quite a few tolls along the highway. At one point–it was one lane each way with plenty of buses and trucks–we decided they were charging a toll so that they could eventually build a highway. We drove 444 km today. Though it started out cloudy in Lima, it was sunny and hot most of the way, peaking at 32 C (89 F). 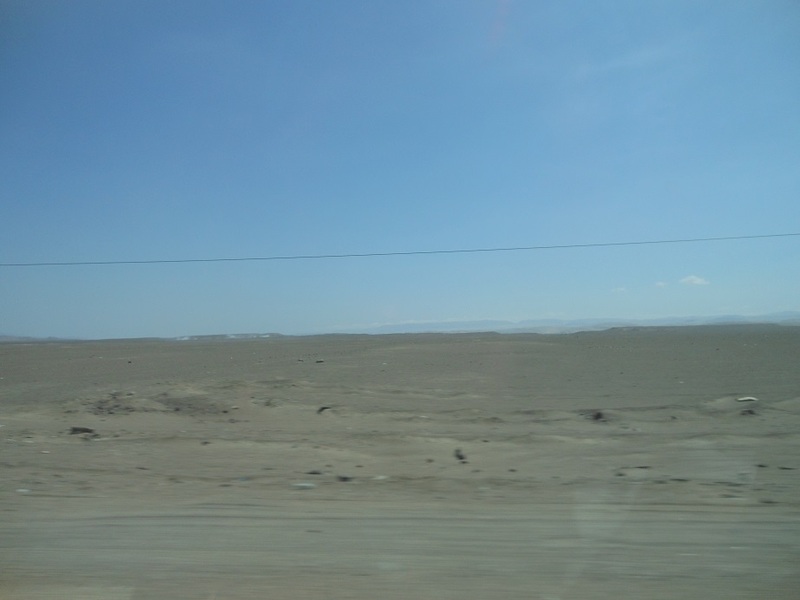 We took just under seven hours, leaving Lima at 8:45 am and arriving in Nazca at 3:40 pm. In the early afternoon, we discovered that the car was overheating, so turned off the air conditioner, and that seemed to help. Then it didn’t seem to make any difference. When we got to Nazca and called Carlos (driver, handyman) he suggested it could be the thermostat. We will have to get it looked at. 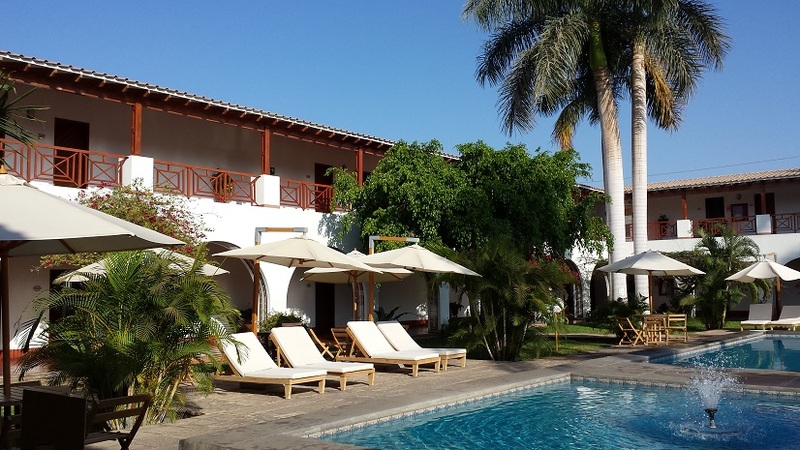 Fortunately for us, our day ended at the Hotel Lineas de Nazca, where they have a pool! We went directly to the pool after checking in–exercise, stress reliever and general go-soak-your-head fun. We drank complimentary miniature pisco sours beside the pool before strolling down to the Plaza de Armas. We took a turn around the plaza; at 7 pm every seat on every bench was filled with people waiting to see who else would turn up. We went down the street to the restaurant Los Angeles for dinner. The man waiting on us gave us copies of a very old book by Maria Reiche on the Nazca lines to read while we waited. The copies were falling to pieces, and printed on acidic paper that turned yellow long ago, but they were signed by Reiche herself and the black and white prints of one of the lines aligned with the setting sun on the winter solstice was surprisingly clear. We have flown over the Nazca lines in the past (Jonathan three times, Winifred twice), so we won’t be stopping for that experience. If you are thinking of making the trip, we strongly recommend flying over the lines. You really cannot get a sense of them from the ground, and from the air they are remarkable. It is surprising, too, that they were not noticed until 1939 when Paul Kosok, a historian interested in canals and ancient agriculture, went to Peru and carried out a rather general aerial survey of the coast. Kosok did not end up working in the Nazca area, and Maria Reiche, a German woman, began looking at the lines and spent the rest of her life among them. Kosok produced a beautiful and informative book called “Life, Land, and Water in Ancient Peru,” that is full of aerial photos of the coast north of Lima with comments about the remains of ancient civilizations that can be seen right on the surface, but that are best viewed from the air. Jonathan and I started our work in Peru in 1999 by looking at Kosok’s photos of the Fortaleza, Pativilca, Supe and Huaura Valleys. Since we were only in Nazca for an afternoon and evening, the Nazca Lines Hotel was the center of our interest on this trip–it was great. Very clean and light and air conditioning that worked. Breakfast was good, too. They serve the usual bread and fresh fruit but also offered to make eggs to order and had wheat germ and bran and kiwicha (andean grain) to sprinkle on cereal or yogurt.